For many of us, a memorial service or mass held after the funeral is an important part of our final goodbyes and farewells. We aim to help you give your beloved friend or relative the tribute they deserve, which is why we provide a memorial mass service to our clients. We will ensure that the service is carried out in accordance with your particular religious observances. As well as this, we will work with you to create a personalised tribute which befits the life and character of your loved one, and also the thoughts and feelings of those left behind. 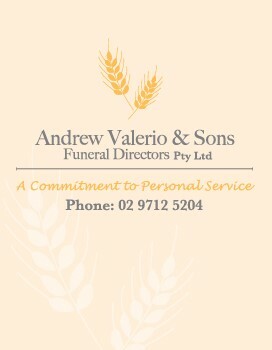 The team here at Andrew Valerio & Sons are waiting to provide you with the assistance you need. For more information, get in touch with us today.